Chances are, you don't want to read a day-by-day account of our latest travels, so I'll quickly cover some of the highlights of our latest vacation in a few paragraphs. The adventure started in Mossel Bay, as we journeyed up into the Klein Karoo, overnighting at a small guesthouse in the tiny town of Ladismith. We then moved onto the "Switzerland" of South Africa, passing first through the not-to-be-missed Seven Weeks Poort, before driving onto Ceres and spending a night at a wine estate in Tulbagh. From there, it was onto Franschhoek, where we stayed at the 5-Star Le Franschhoek Hotel and Spa for two nights, and dined at some incredible French restaurants, including Burgundy and the French Connection. And since no visit to South Africa's wine region is complete without a cellar tour, we popped into the Boschendal Estate (one of South Africa's oldest wine cellars) for lunch and a tour of the premises. From there, we headed over to Stellenbosch, staying the night at the well-known Spier Wine Estate, and eating at the ultra-hip and fun restaurant, Moyo. 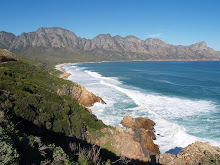 Then it was onto Hermanus, Swellendam, and Arniston, including an awesome scenic coastal drive along the R44 (where we spotted a couple of right whales!). Along the way, we spotted patches of wildflowers, making a rare early appearance due to recent heavy rains, followed by sunshine. We finished up with three nights in Cape Town, where we stayed at both the landmark Mount Nelson Hotel and the Victoria and Alfred (by far our favorite Cape Town hotel!). While in Cape Town, we finally managed to visit the ex-prison on Robben Island, where Nelson Mandela served most of his time as a political prisoner. We also visited the Two Oceans Restaurant at the Cape of Good Hope (where we took these super-cute photos), returning to the city via the one of the country's most incredible roads, the Chapman's Peak Drive. As we left Cape Town, with Table Mountain to our backs, I had to fight back the tears... who knows when we'll see her again? you guys look like twins in the top pic!